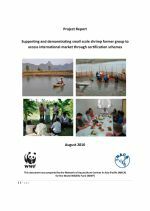 Aquaculture certification and market access: Opportunity or bottleneck for small scale farmers? C.V. Mohan presents on aquaculture certification and market access and the implications for small-scale farmers. Sureel Singh presents on Fair trade as an enabling mechanism for small-scale farmers in India. Ken Corpron presents on the role of certification in scaling up the national programme on better management practices for shrimp aquaculture in India. 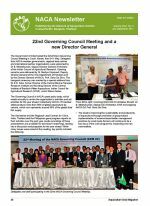 22nd Governing Council Meeting and a new Director General. NACA receives the Margarita Lizárraga Medal. NACA receives Gold Medal Award from the Asian Fisheries Society. Special address by Dr E.G. Silas at the inaugural session of the 22nd Governing Council Meeting 9-12 May, Kochi, India. Striped catfish farming in the Mekong Delta: A tumultuous path to a global success. Sign up for the NACA Email Newsletter. Diseases in Asian Aquaculture VIII: Registration and abstract submission open. Food safety and biosecurity. Ramping up adoption of catfish BMPs. Scaling up BMPs: A national workshop. 2nd Aquaclimate project meeting. This project was conducted to demonstrate small scale shrimp farmer group access to international markets through certification schemes. This project proved that small-scale farmers organised into groups, can improve their technical capacities, and achieve access to markets. This achievement was the result of strong partnerships with producers, private sector and government agencies assisting to develop a sustainable business model for small scale aquaculture. Cost of compliance was found to be a significant barrier to entry. Miao Weimin presents on aquaculture certification opportunities and challenges for small scale farmers. Michael Phillips presents on Thailand's Good Aquaculture Practices certification scheme, and compares it to global standards. A cluster-based approach allows small-scale farmers to participate in aquaculture certification schemes. Small-scale farmers face many challenges in the face of globalisation. Ever-increasingly competition, increasingly strict food safety and evironmental standards, and a growing regulatory burden can make it difficult for small farmers to survive. A cluster or cooperative approach can help farmers achieve economies of scale to remain competitive. A comparison of the variance between Thailand GAP and the global standard, and it's application to the aquaculture industry.